Puff pastry, the queen of pastry, is something even skilled bakers often skip over because it is so labor-intensive and time-consuming. As with me, it might be something you make a few times before deciding "Okay, I've mastered it, don't need to do that again." Frozen works. There's even an all-butter alternative now to the widely known brand of frozen puff pastry, though I've yet to find an organic version. Recipes abound for quick (also known as "rough") puff pastry. Like the slow version, they call for an enormous quantity of butter. I love butter, but I like to cut back the fats in my diet as much as possible (though never to the point of sacrificing flavor and texture, of course!). One day when I was making my usual all-butter flaky pastry, it occurred to me to do a little experiment. What if I used my usual pastry recipe but did a few rounds of folding and chilling? The first batch I used to top Chicken Pot Pies, and the results were amazing. 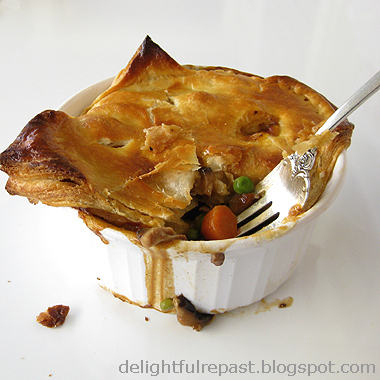 Then beef pot pies (above--I'll post the recipe another day). So I thought, Let's see how it works for turnovers. Beyond amazing! Come back for that recipe soon. 1 With metal blade in place, add flour, salt and baking powder to work bowl of food processor. Turn on for three seconds to combine. Add the frozen butter and pulse for three 1-second pulses. 2 In cup, combine lemon juice or cider vinegar and ice water. Pour liquid over all of flour mixture and pulse for three 1-second pulses. It will be very crumbly. Don't worry about it. Note: No food processor? No problem. On large cutting board, mix together flour, salt and baking powder. 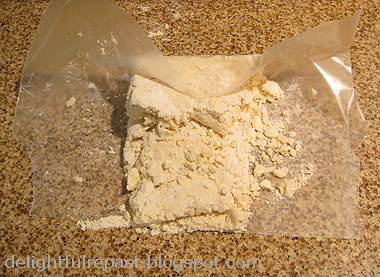 With pastry scraper, cut frozen butter cubes into flour mixture. Mix the ice water and vinegar and sprinkle over the mixture, tossing lightly with a fork. You'll think it's just a big pile of nothing, but don't worry about it. 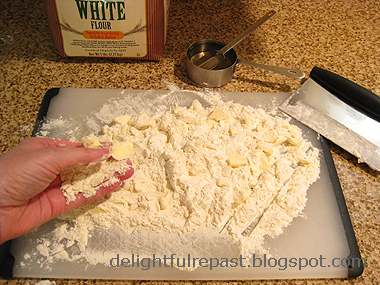 3 Turn the crumbly dough out onto lightly floured 12-inch square of parchment paper, and roughly shape into a 12-by-8-inch rectangle. Using a bench scraper or just the paper, carefully fold one third of the rectangle toward the center, then fold the other end to the center, like a letter. (It will still be a crumbly mess at this point.) Rotate the dough 90 degrees, then press (no need for rolling pin until after dough has been chilled) the dough again into a 12-by-8-inch rectangle. Repeat. After that third turn, cover and place in the freezer for 20 minutes (or in the refrigerator for 45 minutes). Note: Work rather quickly. If at any point in the process the butter starts warming up or the dough seems to be getting soft or sticky, immediately cover and refrigerate it until it firms up. 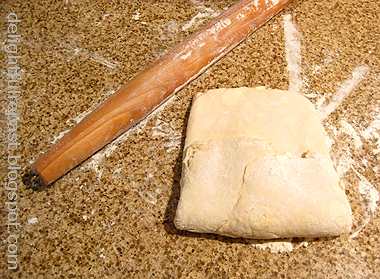 4 On lightly floured surface, with floured rolling pin, roll the chilled dough into a 12-by-8-inch rectangle. Fold into thirds. Rotate the dough 90 degrees, then roll out and fold again. Roll the dough out once more and fold again into thirds. Roll out and fold once more, for a total of 4 turns. Note: I have every kind of rolling pin there is, but the tapered French rolling pin is the one I use most often. The J K Adams FRP-1 is made in the USA of maple. I never skip puff pastry because ... I buy it in the store. :) Puff pastry is one of my most favorite ingredients. Yes, I just called it an ingredient :). Shame on me I don't know how to make it. Barb, thank you! I guess you could say I'm into healthy comfort food. Not to worry, Julia - some people are even afraid to use the store-bought puff pastry! Jenn, thank you so much! Being called "brilliant" just made my day! Thank you, Mary! I like that - "a noble exercise." Labor-intensive? Fo’ sho’. A look at your cutting board/counter/wax paper reminds me that I began my endless college career as a chemical engineering major at MSU in Kedzie lab and that said lab blew up (I was across campus working-out in Jennison Fieldhouse at the time). You know, it occurs to me that your methodology/itinerary for shopping organics et al would make a nice column. You mentioned that, and it must have evolved into a pretty thorough and potentially short-cutting process by this time. Eh? Hi, Sully! Thanks for the suggestion. Maybe I will do a post strictly about organics. It's been a part of my life for so long, decades, that perhaps I take it for granted. I've never made my own puff pastry. This looks fairly easy and totally delicious. Thanks, Pam. Let me know how it turns out for you. With the rise of "insta-roll" stuff from supermarkets these days pastry is sadly a bit of a lost art. Aside from a bit of shortcrust I've never really gone too much into the many intricacies of the stuff. I really should, and without saying too much, there's one I really want to try when I get back from England which may be popular among some, hopefully! Thank you, Charles. At least the insta-roll is closer to homemade than the ones that are frozen in aluminum foil pie pans. And the frozen puff pastry is really quite adequate, though it has lots of ingredients I'd rather avoid. Ah! the rhythm, some assonance and a soupcon of alliteration OOOOOOHH! The things those lovely little language things do to me!!! OH!!!! Quite a recipe of words, Jean. Thanks, Tony! Coming from a wordsmith like yourself, that's quite a compliment! 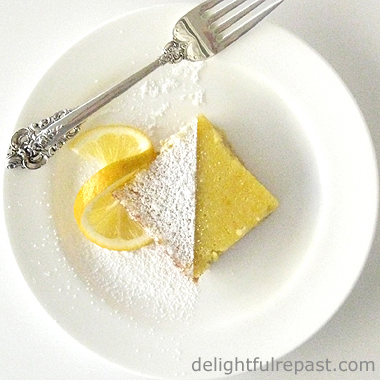 Hello there, I came across your blog today and was amazed by how delicious this recipe looks! I'm sure it tastes divine! :) Great page! Erica, thank you! 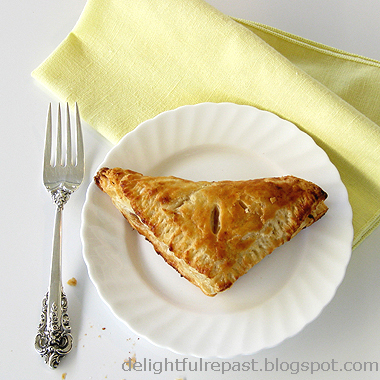 My husband loved it, and the turnovers too. I made them again today. Thanks, Greg. With regular pastry, you handle it as little as possible and it turns out tender and flaky; with the ruff puff, the pastry gets a lot of handling with the folding and rerolling and turns out with many delicately crisp layers.